Play Cops ’n’ Robbers online for free now! Hands up and hand over the loot! Now that’s the perfect motto for a slot machine! 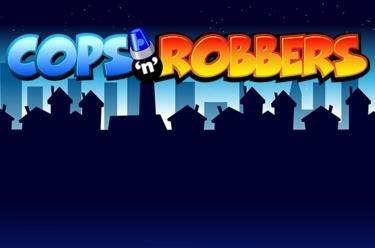 In Cops ’n’ Robbers you raid safes, escape the boys in blue and openly bag huge winnings! The Scatter combinations sweeten your deal with 3 lucrative coups which won't leave you empty-handed! Your aim: Land 5 identical symbols along a win line! You win when you fill up one or several win lines with matching symbols! Your symbol combination always has to start on the left side of the first reel and run along the win line without being interrupted by other symbols. 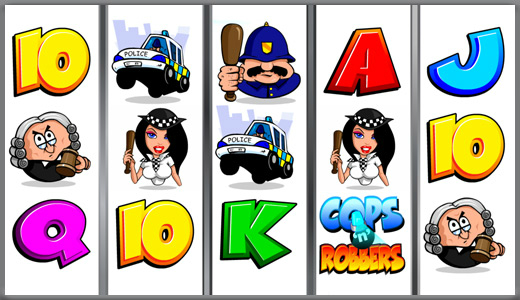 Free Spins 3, 4 or 5 police sirens in any position win 15, 25 or 100 Free Spins respectively. All wins except 5x WILD count as x3 in the Free Spins. The Free Spins are played with the same number of lines and the same bet as in the last regular game. You can win further Free Spins and other feature games within the current Free Spin. Safe Cracker Feature: With 3, 4 or 5 Safe symbols you can clear out any safe in peace! Simply select a safe, open it and cash in! Every safe contains a multiplier that will be multiplied with your bet. The winnings will be added to your credit immediately. Hot Pursuit Feature: If you land 3, 4 or 5 ‘Cops ’n’ Robbers’ symbols, it’s time to grab the loot and run like crazy. But be careful: The cops will be hot on your heels! Click on the Start button to roll the dice and move your robber along. Then the cop takes up the chase. The multipliers of all of the fields you land on are added together. If you are caught by the police then you have to stand in a line-up in which you will either be acquitted, released on bail or convicted. If you are set free or on bail, then you can continue raiding. If you are convicted the feature is finished and you win the current sum of raided multipliers x your bet!